What’s the best food for cats with kidney disease? There’s no way a short article can tell you everything you need to know about kidney disease nutrition. Years of scientific research and experience have left CKD cat guardians, seasoned veterinarians, and scientists with more questions than answers. In this article, we’ll explore the dynamic and complex relationship between diet and feline kidney disease. You’ll learn how the best cat food can help your cat feel better longer, identify the key qualities of a good food for CKD kitties, and get to know five of the most popular renal diets on the market in 2019. Once your cat has lost kidney function, they can’t get it back – but the right food makes the future brighter. Feeding your cat the right food is the best way to slow the disease’s progression, minimize symptoms, and give your cat the best life possible. The best foods for kidney disease improve your cat’s quality of life by keeping your cat hydrated, supporting lean body mass, and reducing toxins in the bloodstream. 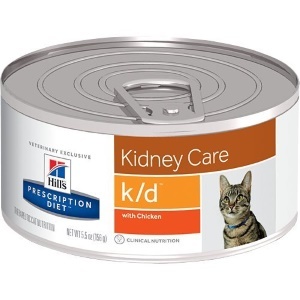 Prescription Cat Food for Kidney Disease – Good or Bad? Even the best commercially-sold conventional diets don’t do all of these things at once. This leaves you with a couple of options. You can hold your nose over the questionable protein levels, high carbohydrate content, and unwholesome additives in a therapeutic or prescription diet, or you can make your own CKD-appropriate food. By preparing your own food, you can correct the flaws of therapeutic foods while mimicking the things that they do right. Click here for guidance on creating a raw diet for your cat with kidney disease. Above all, cats with chronic kidney disease need to eat. If possible, make dietary changes while your cat is still interested in eating. Also note that cats often develop an aversion to the food they ate during hospitalization. Cats in the later stages of kidney failure may feel too sick to try something new. If your cat is refusing to eat, don’t worry about feeding a therapeutic diet. Any food they’re willing to eat is good food. When protein breaks down during digestion, it produces waste. When the kidneys are functioning normally, they filter out this waste and send it on its way into the litter box. But as your cat loses kidney function, it becomes increasingly difficult to remove these waste products. Instead of passing through your cat’s body, they remain in the bloodstream. This is why BUN levels rise in cats with CKD. In an attempt to reduce BUN levels, cats with CKD are often given protein-restricted foods. But in recent years, this practice has become increasingly controversial. Some experts worry that a protein-restricted diet will lead to severe protein deprivation, decreased muscle mass, and poor physical condition. Instead of cutting back to 20% or less calories from protein, you may choose to feed moderate levels of highly digestible, low-waste protein from high-quality animal sources. Choose foods that are low in phosphorus. As kidney function declines, phosphorus is one of the things that doesn’t get filtered out. As phosphorus builds up in the bloodstream, your cat will start to feel ill and kidney function declines even more quickly. The best way to counteract this effect is by reducing the amount of phosphorus in your cat’s diet. 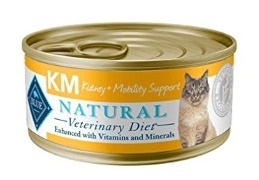 The ideal diet for a cat with CKD contains less than 0.5% phosphorus on a dry matter basis. Reduce inflammation with omega-3 fatty acids. Many cats with kidney disease develop nephritis, or inflammation of the kidneys. Animal-sourced omega-3 fatty acids can reduce that inflammation, helping your cat to feel better for longer. Increase your cat’s intake of B vitamins. Because cats with kidney disease urinate so much, they often lose crucial B vitamins in the litter box. Deficiency in B vitamins is associated with loss of appetite and overall poor health. When bacteria and endotoxins enter the gut, probiotics can help to perform “enteric dialysis”, taking on some of the detoxifying function that the kidneys have lost. Azodyl is a synergized prebiotic and probiotic supplement designed specifically for cats with kidney disease. Note that all of the foods on this list are canned products. Because cats with kidney disease are prone to dehydration, choosing a high-moisture food is acutely important. 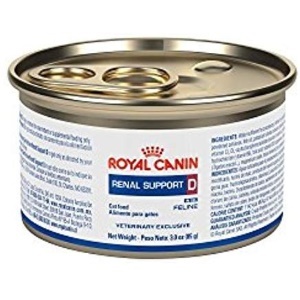 This gravy-style food from Royal Canin is available by prescription only. It receives consistently positive reviews and doesn’t seem to share the palatability problem that most kidney formulas face. The food is 30% protein and .44% phosphorus on a dry matter basis, helping to control toxic buildup in the bloodstream. This food is available by prescription only. According to Hill’s, this pate style canned cat food is “clinically tested to improve and lengthen the quality of life”. It achieves this by ticking all the standard kidney disease diet boxes. The phosphorus content of this food is restricted to .49% on a dry matter basis and the protein is 30% on a dry matter basis. You might appreciate the convenience and cost advantage of buying a specially formulated non-prescription food. The phosphorus percentage is about .71% on a dry matter basis, so it’s slightly higher in phosphorus than other formulas. If your cat refuses to eat a lower-phosphorus recipe, you might try this one instead. In addition to lower-than-average phosphorus, the food has restricted protein content at 36% on a dry matter basis. 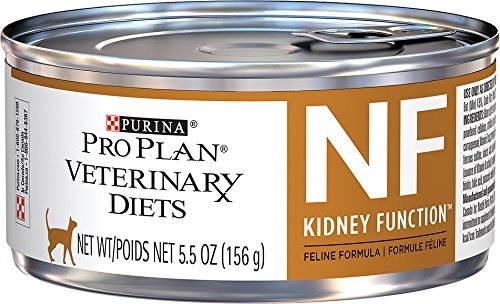 Available only with a veterinary prescription, this food from Purina does everything a standard renal diet does. 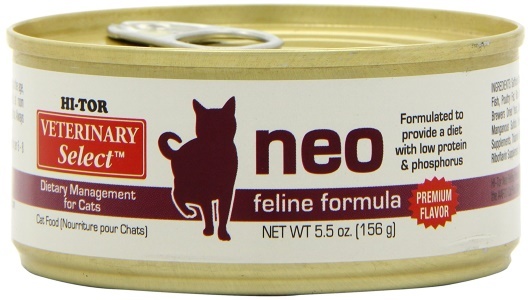 According to customer reviews, this pate-style food is palatable for cats. On a dry matter basis, the formula is approximately .49% phosphorus and 34% protein. Although this food is called a “Veterinary Diet”, you can purchase it without a veterinarian’s prescription. In addition to standard renal diet features, this food is formulated with glucosamine and chondroitin for joint health support. The pate-style food gets mixed taste test results – a notable percentage of reviewers say that their cats didn’t like the food. Compared to other renal care products, this food has slightly more phosphorus and less protein on a dry matter basis. It’s .77% phosphorus on a dry matter basis and about 28% protein. Helen of FelineCRF.org has created an extraordinary resource for anyone caring for a cat who has CKD. The site contains over a thousand pages of information on almost everything you need to know about feline kidney disease. Click here to browse FelineCRF.org’s food databases of dry and canned products sold in the US and UK. As your cat’s kidney disease progresses, it’s likely that you’ll have to pry out their appetite with a variety of foods. These databases may help you to evaluate your options based on CKD-relevant metrics. Click here for a thought-provoking discussion on feeding and caring for cats with kidney disease. In this 34-minute interview, well-known veterinarians Karen Becker and Lisa Pierson explore the causes and treatment of kidney disease in cats. Pierson’s common-sense approach is a calm in the storm of confusion that is chronic kidney disease.